THIS is a story on my Auntie Baby (Josefa Reyes, aka Josefa Villanueva), my father's younger sister, who has been a ballet dancer most of her life. She lives in Sta. Clara, California where she continues to teach dance to young kids. I just love her photo in the paper - every inch the ballerina. For almost 40 years the Santa Clara Ballet has been an integral part of the South Bay arts scene, thanks to the dedication and perseverance of the company's founders, Josefa Reyes and her late husband Benjamin Reyes. The Reyes' hard work hasn't gone unnoticed. 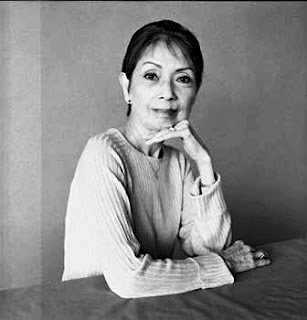 Earlier this year, the San Francisco-based Isadora Duncan Dance Awards – the "Izzies" – Committee honored Josefa Reyes with its Sustained Achievement award … for offering instruction and training in classical ballet and …performance opportunities for children and Bay Area professional dancers." The Isadora Duncan Dance Awards, or the Izzies, is one of the most coveted dance awards in the US. The Sustained Achievement award recognizes "outstanding contributions spanning ten or more years in any field of Bay Area dance, including teaching, choreography, performance, writing, photography, visual design, music, support services, administration, etc." The awards will be handed out on March 14, 2011, at the Yerba Buena Center for the Arts Forum, 701 Mission Street at 3rd in San Francisco, California. When I was little, and my Auntie would come home from the States, she would always encourage my cousins and I to continue pursuing ballet, especially when she found out we had been slacking off. I suppose at such a young age - I was dancing til I was 8 or 9 years old - I didn't understand what ballet dancing could give me. Discipline. I guess it was discipline that helped her cope with her busy schedule - dancing regularly and working at another job to pay the bills, when she and her husband Uncle Benny+, were just trying to carve a niche in the States. I remember that one of her earlier jobs was as a telephone operator. Every Christmas, it is my Auntie Baby who sends the earliest Christmas cards to the family. She really knows how to manage her time. She said her Christmas greetings were early bec. she was already about to start her ballet kids' rehearsals for the Nutcracker Suite. Not a year would go by that the Santa Clara Ballet School didn't mount the Christmas ballet production. It was always the culminating activity of her ballet school, which all kids and their excited parents looked forward to. We're very glad she got an Izzie because she and Uncle Benny, have really worked hard to train so many kids in their area, encouraging their love of dance. Many them have gone on to successful dance careers. Congratulations Auntie Baby! We're very proud of you!